There is a reason why there are many wood outdoor decking choices. Not all wood species are the same and neither each home’s needs. The finished look is different not to mention the maintenance requirements. And then there is the matter of cost. Although the final price you pay for deck building and installation doesn’t depend only on the material you choose, it still plays a great role. When you intend to order custom decks, you most likely have a particular style in your mind. You also have certain expectations regarding its maintenance and longevity. Ipe and cedar are two very popular choices for deck construction – each for its own reasons. 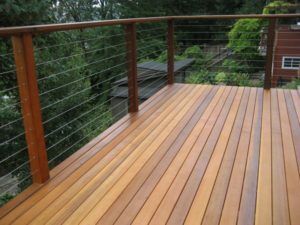 What makes cedar decking a great choice? One important factor to consider is that cedar custom decks are relatively affordable. Their fair price makes this type of wood a very popular option for decks. But you need to take into account the quality:cost ratio. Cedar has good qualities. It will last for 15 to 20 years, but it will require regular maintenance. This is a softwood that has a relative resistance to fire and rot, and it’s a much better choice than pressure treated wood. Its main drawback is that it will need constant staining to remain resistant and nice, but over the years it will lose its initial beauty. So, you pay a fair price and cedar has a relatively good life expectancy, but it will keep you busy over the years. 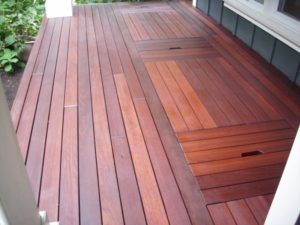 Ipe is the top choice for decks. If you want a strong construction that will outperform any other wood option, get an ipe outdoor decking. It’s heavy, hard, dense, and resistant. It has a class A fire resistance and you will hardly find any knots. The more it ages the more beautiful it becomes. Its natural elegance is unbeatable and the good news is that you will keep it for around 50 years. The bad news is that this is the most expensive wood choice. But if you consider that it will hardly need maintenance apart from some staining here and there and how long it lasts, it’s worth the extra buck. What’s vital to remember with ipe is that its hardness requires experienced pros. You need to find expert ipe deck builders to be sure your hardwood will be constructed right. 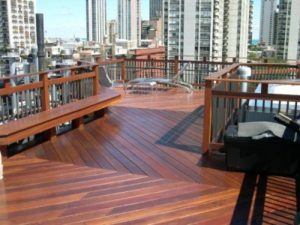 Why ipe and cedar are the best wood decking choices? The quality of the pressure treated timber is much lower than cedar, which is still an average quality choice when you compare it with ipe custom decks. And then you have the choice of composites, which are great if you want a literally maintenance-free deck, but that’s it. In terms of beauty, it doesn’t begin to compare with natural wood options. Naturally, everyone has different needs. And cedar & ipe cover these needs. With cedar, you pay less and get a beautiful deck but you will need to maintain it. With ipe, you pay more but almost forget about its maintenance and keep it twice as long as cedar. And don’t forget that the price you pay depends on the structure and its size & design, and whether or not you will also install a deck railing system. So, if are bouncing between the two, remember that it’s all about choices.